Friend, partner or parent we all know that someone who loves to help but ends up being more of a hindrance than a helping hand. Your probably thinking of that someone right now and they’ve probably never touched a horse before they met you right? Now it is possible to almost convert them and although it takes time it can be done. My boyfriend ended up being very helpful in the end so these points are said with a light heart, and mean no offence to anyone. The truth is we would probably struggle without them but don’t tell them. The first time the non horsey helper meets your horse is always slightly awkward. Do you let them loose, warn them about the dangers or even have a hands off rule? I was lucky and my horse at the time despite huge was welcoming of almost anyone. I went for the proceed with caution but if you want to stroke her then go ahead and avoid her backend. Within a few minutes Tom had fell in love, Dee was loving the attention and the avoid the backend rule had gone to plot. You will find rules with non horsey helpers don’t work so always keep an eye out. Normally the second stage to the non horsey helper and horse relationship. There’s something about leading that means you’re a born horse whisper right? Ok so to start with its normally a you hold near the head, ill hold the end just in case type job. Automatically non horsey helper manages to either hold way too tight and close to the head and scare the horse or somehow unclip said horse. Either way you have a spooked loose horse, and a non horsey helper that’s over the moon with how much the horse loves them. The second attempt normally goes much more smoothly. Once leading has become successful, it’s time to start with the head collar application. Your almost half way there to having your horse caught and brought in for you, keep this in mind when it takes your non horsey helper hours to apply the strange contraption we call a head collar. Who knew that figuring out a few clips was harder than a rubix cube? After a few (a lot) of attempts, some assistance and a very patient horse you finally have the horse in the head collar. This skill will take a few weeks to master completely. You will find your horse will almost always be lead to you with its ears through the nose band if you trust your non horsey helper to catch your horse on their own. Or if like my boyfriend you give up and just put the rope round the neck and bring in that way. Apparently its safer as they can run way if needed? I don’t want to know how he found that out. 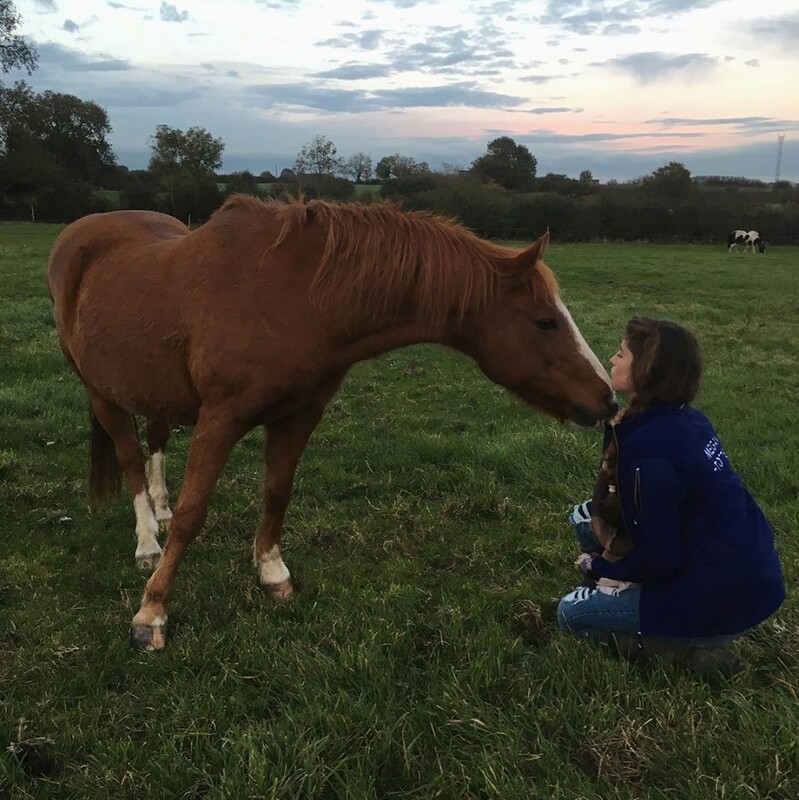 After complaining about how much hard work horses are to look after it goes without saying that if they want to love and lead your horse then they need to learn how to do the hard jobs too. With no horse involved surely mucking out is the least risky and easier task to learn for the non horsey helper. Nope, apparently taking only the wet straw and poo out means taking all of the bed out and leaving you with a full muck trailer, and a few strands of straw left in the stable. Make sure you leave enough time for this task, apparently every horse on the yard has to be cuddled in between muck heap trips. Order in more straw too, preferably before the non horsey helper mucks out. After all the work they’ve put in, the bites, the broken toes from being stood too close you’re your mounting, the 100’s of trips to muck heap and all of the sighs from you they’ve endured it’s only fair if possible to let them have a sit on your horse. I mean it is a big thing to ride a horse, and even touch a horse is actually quite brave and we probably forget this when lecturing the non horsey helpers about why they can’t jump on your horses back in the field while it grazes peacefully. Actually getting non horsey person on the horse is a challenging within its self. No matter how many times you’ve shown , explained and made sure they get how to get on the horse the first mount is always a disaster. Once flopped onto horse, clambered up the saddle and sat up almost straight they realise that it is quite a long way up. Comments such as I could ‘gallop her well easy’ etc soon fade away and after 10 minutes of persuading them to open their eyes you may manage a walk round the arena. After sliding off with a thud, they will then precede to tell everyone they have had a lovely collected canter and jumped a huge fence and that horse riding is easy. Just agree, and share the funny clinging on for life in walk videos and photos later. Once the basics have been almost mastered your non horsey helper *cough new groom, actually becomes very useful. Having an extra helping hand is beneficial and despite the initial issues they soon become naturals. Tom was amazing once he got the hang of things, he’d come to shows, help groom and Dee loves the extra kisses. Just make sure your horse is ok with being messed about. Tom would lead Dee, a 17hh thoroughbred confidently pretty much anywhere yet give him my 13hh welshy and he suddenly decides horses aren’t his thing. Good luck with your non horsey helpers, be patient and keep safe!